Joseph Blasidocuments and describes the workings of an existing kibbutz society to provide a model for Utopian thinking and clear up confusion con­cerning Utopian values. He details the history and development of Kibbutz Vatik (a pseudonym), providing a systematic record of kibbutz culture: daily life and social arrangements, economic cooperation and work, politics, edu­cation, and attitudes of community members.Despite its advantages as a model Utopia, the kibbutz is not a perfect soci­ety. Having eliminated the most serious forms of social, economic, political, and educational fragmentation and violence, the communal group is left with the complicated and mounting problems of keeping a fellowship alive and well. Blasi assesses the community's advantages and disadvantages, il­luminating the interlocking dilemmas that cut across social and political con­cerns.The Communal Experience of the Kibbutz updates our knowledge of kibbutz life in light of recent research. 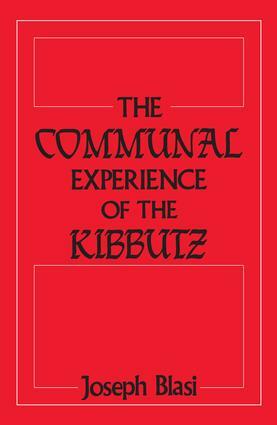 It gives a detailed account of the Utopian community in the kibbutz and its activities. The special quality of the kib­butz, Blasi argues, lies not so much in its proven success vis-a-vis other communal societies, but in that it is a communal alternative that most West­ern peoples can readily visualize as a real option.